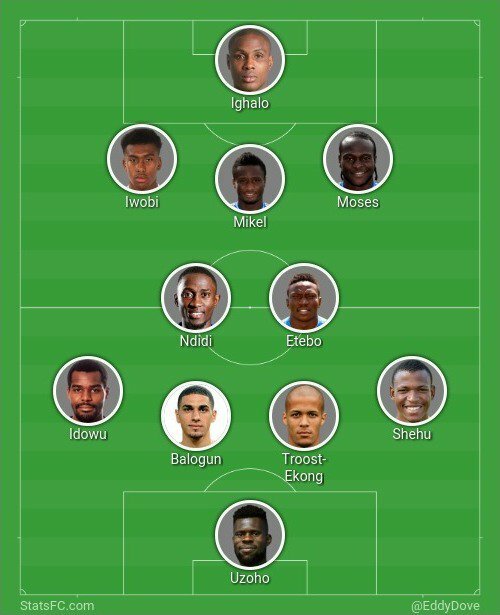 I've launched my Nigeria 2018 World Cup squad selector, which gives Super Eagles fans the chance to pick their starting XI for the DRC friendly, and their final 23 for the Russia. Any feedback, let me know. In my opinion, this squad will go far in Russia. Rohr must ensure that Mikel only plays 60mins when we are leading and 80mins when we are drawing. This elevn has 6 strong defensive players and 4 players that can create and finish. Victor Moses must treat Simy as Giroud and Morata at Chelsea and feed him and Simy will finish. I could find no room in the squad for Ogu, Uwa, Joel, Agu etc etc. You should email your instructions to Rohr with alacrity. Btw, what when should he get off the bench and give instructions? Is the 20th, 35th and 60th okay? I visited the "Squad selector" Site. Wow, beautiful job - bro. Very is nice. Thx! This will do the job, except maybe I would start Shehu instead of Ebuehi. Nacho's natural position is support striker. Each time Rohr started him as arrowhead in the qualifiers, he did not cut it. He started once in that position. We won 3-1. He scored a goal as a #9 (replaced Ighalo) vs Cameroon. I like the look of this side, Goldleaf. The idea of drafting Simy into the 'Giroud' role is pretty compelling, certainly his frame - and his form - make him a really interesting addition to the squad. I'd be stunned if Elderson was left at home again (and heartbroken for him), whereas for me, Joel has to go because of his versatility and his ability on the ball. Agu's in trouble I think. e de sweet me o! ga gaa! e de paini you o! ga gaa!! e sweet me o ga gaa, ga gaa!! Is well o my brother.. pretty long.. how is your family. .. where are u now? Loving the look of this team, but out of interest, why would you start Ebuehi ahead of Shehu or even Aina at right-back? What he did vs Argentina was impressive. I believe he’s our best rb on their best day. It will be intriguing to see which way Rohr plays it. 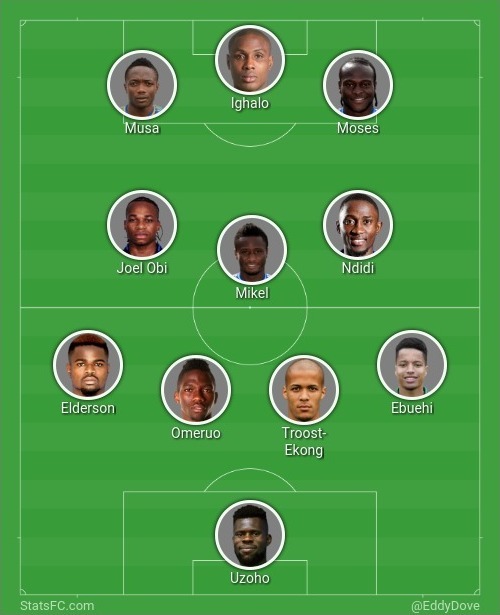 To be honest, we should be delighted that Nigeria have such wealth of options at full-back - no need to drag someone in from the dark like Kunle Odulami four years ago! Blast from the past! He was playing at Sunshine Stars of Akure. Only God knows where he is now along with the giant Azubuike Egwuekwe. Egwuekwe seemed to be making his way to West Ham at some point. I prefer Omeruo to Balogun, Omeruo is better playing the ball out of back. Balogun is prone to errors when pressurized and makes too many errant passes. There is no doubt we will be pressed making the ability to pass out of it consistently of critical importance. I think Elderson is the superior LB we have at our disposal - he is better than Idowu and Aina in my opinion. For the RB slot, I prefer Ebuehi simply because he has more speed compared to Shehu. Shehu works hard, but he consistently gets beat though he has excellent recovery. My problem is that by the time he recovers, the ball is already in the 18-yard box. I can easily envision our opponents awarded cheap penalties. I admit I never appreciated Ighalo; I often wondered what Siasia saw in him when he played for the Flying Eagles. But now, I have gladly consumed the humble pie and washed it down with "Rum & Red Bull", it is a MUST that Ighalo spearheads our attack. He will not let the opposing CDs rest; this is exactly what we need. Akin to boxing, Ighalo delivers the jabs; this has a cumulative effect. Musa and Moses as support strikers insert pace and creativity to provide a three-prong attacking menace no opposition can withstand for long. The goals might not come early, but they will surely come and come often. Gba be! In my opinion, this squad will go far in Russia. . I always suspected you are a foreigner, but I wouldn't have guessed in my wildest dream that you are from Croatia. You want us to use this line up so Croatia go wire us well well.